Clearly a new forum without much owner content at this early stage. Thought I might kick off a thread, having ordered my Ioniq Electric back in December 2016 for March 2017 delivery. I'm dropping my Outlander PHEV in favour of the full electric Ioniq, having analysed my trip profile over the near two-year span with the Outlander. Hopefully I won't suffer too much from the dreaded 'range anxiety' ! Would be great to hear from other owners or owners-in-waiting. I am also waiting for an Ioniq (EV). Last guess of my dealer was arrival around mid February. I ordered it at the beginning of December. Anyway, I hope that means that my car is coming soon. Can't wait! A bit more down the road towards running the Ioniq. 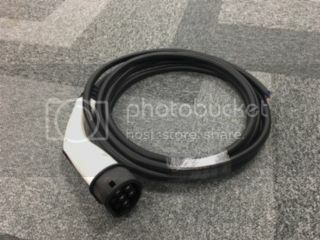 My current car has a type 1 socket, and my charger (a Rolec 32A) has a tethered cable, so I had to purchase a type 2 tethered one. It will be just a matter of changing the cable once the Ioniq arrives. Just had a call from the dealer stating that my Ioniq has been delayed. Having been advised at the time of order in December that mine was one of six remaining in my colour choice "in the factory", delivery to the dealer was supposed to be by the end of February. Now it seems, following an unspecified delay to the Premium SE spec vehicles, the car still hasn't left Korea and remains up to 8 weeks away with delivery now set for more towards mid April. This puts me in a sticky spot, as my current lease vehicle needs to be returned by mid-march. Have you asked for a month by month lease extension? Not as yet, and I'm sure it is possible and will be considered, but from past experience (of a colleague) lease extensions come at a premium. As for my own experience, I have twice before had factory order vehicles delayed, but in both cases the supplying dealer provided a loan car until the new one arrived. Sadly, the Hyundai dealer can offer no such option. What do you mean? Not only have my two lease extensions not cost more, one of them gave me two free payments. LeftieBiker wrote: What do you mean? Not only have my two lease extensions not cost more, one of them gave me two free payments. I mean that the colleague in question was quoted some 20% more on his previous monthly lease to extend his Mercedes by two months. They cited the reason as being his initial payments were calculated on the car being a certain age at the end of the lease, and returning the vehicle later meant it would be worth less. Needless to say, he took the umph and borrowed an old banger from a family friend for two months intead. I am encouraged by your experience however, and will certainly approach my existing finance company. Thanks for the info. Just spoken to the finance company. They too want a premium as per my colleague's past experience. In my case, just over 20% more per month. consider buying a old beater and using it for a trade in and take the complete pressure off of yourself. You may even make a few bucks, but even if you lose, mentally charge it of to interest you were not paying or leasing costs not paying, then everyone is happy. Bottom line is once you take into account Insurance costs, reliability of an old beater, fossil fuel costs, etc., it just adds up to more hassle. At least my future Ioniq has been built, but I guess that isn't that difficult to do because it only takes 3.8 hours to fully assemble. Seems the bottleneck is shipping capacity.